Over the last few months Volkswagen has introduced a number of intriguing concept cars, including fan favorites such as the Golf R 400, T-ROC sport-ute and the one-of-a-kind GTI Roadster. With this pleasant wave of creativity, VW is rolling out another concept sure to keep this momentum going. And the latest is the Amarok Power Concept. The Volkswagen Amarok Power Concept is a uniquely modified pick-up, that seems more at home at a music festival than the Wörthersee meet in Austria. That’s because the truck bed has been modified to house a 5,000-watt speaker system, turning the medium-sized work truck to a mobile rave party. Specifically, VW chose Allen & Heath, Pioneer and Void Acoustics to supply the audio components for premium oontz-oontz. To help the truck stand out, the Amarok Power Concept comes with 22-inch Gunmetal wheels with matching side view mirrors and orange brake calipers. The body is coated in Dynamic Grey metallic paint with orange decals on the doors and side of the bed. Meanwhile, the interior sports black and orange Nappa leather seats with black Alcantara trim on the steering wheel, seats and door trim. 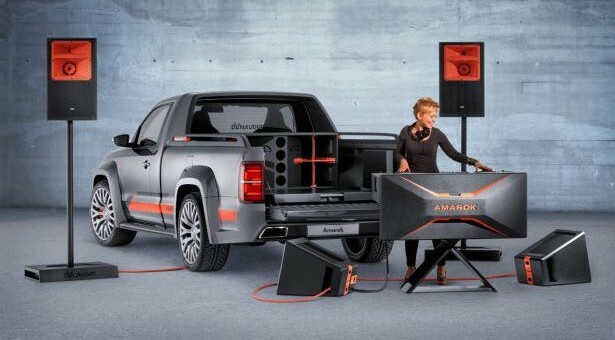 Hopefully the Amarok Power Concept will find itself on a stage to show off its party-time prowess in the future. Car-enthusiast since birth. British at Heart. Just enjoying the ride!